The gift was helping me understand my friend and forgive her for leaving me. Sanctum by Sarah Fine is one of those unique book experiences that blends both despair and hope in equal measure to deliver a hauntingly beautiful journey. I was left floored with a gamut of emotions that I will now try to sort out in the best way possible. But first, let me state a clear and undeniable fact – Fine has an amazing writing ability. And, it’s not only because of how easily she continued to hook me into her novel as I traveled deeper and deeper into the dark city she created; but also because I came to care about the two main characters to such a profound level that when I turned to the final pages I felt slightly empty and sad to see them go… for now. 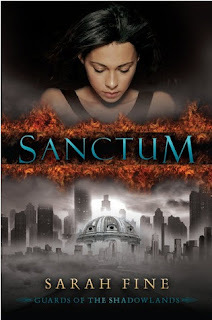 In Sanctum, we meet Lela who is a foster kid that’s had to endure a difficult life. When the novel begins, she meets Nadia and immediately comes to her aid when Nadia places herself in a precarious situation. From that moment, these two girls form a bond of friendship that shifts Lela’s outlook on life and has her building a better future for herself. However, all of that comes crashing to a halt when Nadia takes her life, leaving Lela confused and lost. As Lela deals with her grief of losing her best friend, she’s plagued with vivid nightmares of a dark and sinister place that is the Sanctum for souls who’ve ended their own lives. After a horrific accident, Lela finds herself at a crossroads, she can either lead her soul to the Countryside or enter the Gates of the Sanctum in the hopes of finding Nadia and rescuing her from this city of despair. Lela is such a strong and determined character in so many ways. Throughout the novel we get glimpses of the horrors she’s had to endure as a foster child and the violations she experienced at the hands of those who were suppose to protect her. It was heartbreaking to witness that the first time she finds a champion, a true friend, this person happens to be so broken inside that Lela loses her to the despair Nadia is suffering through. From the beginning of the novel to the very end, I was an adamant fan of this character. I rallied behind her as she fought her demons and sacrificed her existence for what she believed it. Loved this character! Nadia was somewhat ambiguous to me. I didn’t get to know her enough before she ended her life and as the novel progressed, I felt like I was on that same journey with Lela to discover the reasons behind Nadia’s choice. In the end, when we discover the why, I have to admit that I was truly saddened for this character. Malachi was such a complex character in the most rewarding of ways. I fell hard for him and admired the sacrifices he made while paying his dues in the Sanctum. He serves as the Captain of the Guard, but truly he’s more than the leader allotted by his title. He’s a guy that has a haunting past and is working toward a rewarding afterlife. However, he’s ever willing to forego his reward if it’s at the expense of someone he’s come to care about. There were so many layers to his character and having just pealed back a few, I’m left wanting to learn even more about him as his journey continues. As far as the writing goes, I stand behind my earlier statement… Fine is amazing at crafting her setting in such intricate detail as she weaves her events that take the reader from a contemporary feel to a dark fantasy realm. I transitioned quite easily throughout her narrative and as the story progressed, I became more and more captivated and hooked. Everything blended to perfection – the plot, the characters, the narrative, the message behind the novel… Very well done and I can’t wait to read the next installment! Awesome review! Sanctum was such a great book. Gah! I need to read it again! This one sounds really different. I'm glad you liked it. I'm very interested and will be looking this one up.